While taking a walk on the busy Camden High Street, I could easily get overwhelmed by all the shops and cafes fighting for my attention. Looks like there’s everything here, all casually miss-arranged in no particular order: supermarkets and mobile phones, pharmacies and more than plenty of places to grab a bite. In all this noise, there’s a specially saved space for the peppery red and green of a small Mexican kitchen. I see a menu that’s made to make me trip and go right into its breakfasty embrace. I take a side step and find myself in Cafe Mexicana. 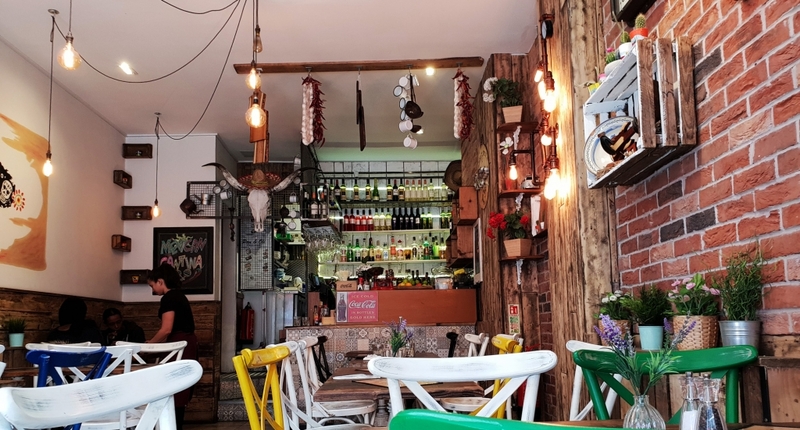 Don’t ponder long about the word ‘cafe’, it’s a proper Mexican Cantina with a twist of world wide breakfast. The interior is packed with cosy, all-together tables and a joyful mix of painted chairs. This decor makes me think of the food they serve, full of colour, spice and ready to make me happy. Could this be a place where healthy people would eat? The menu is anything but short, ready to be the answer to any of my questions. The breakfast sure is tempting with some mouth-watering options, but I’m set to find a few tasty, healthy-lunch dishes. I’m loyal to the Mexican spirit of the place so I’ll order a quesadilla starter, then mix it up a bit on the main. 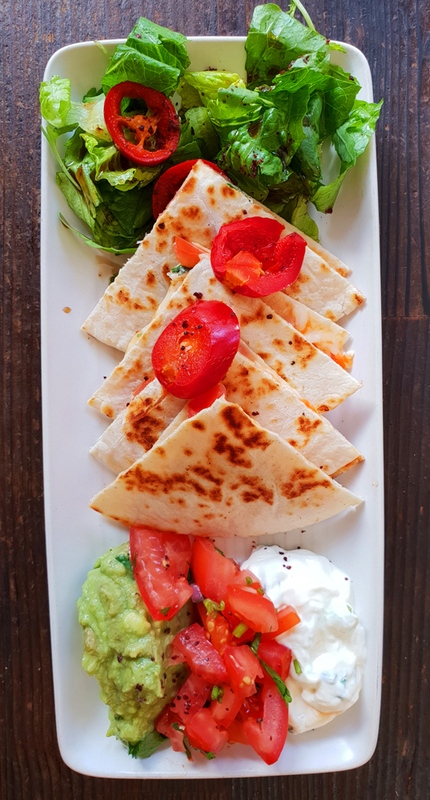 Starter : Quesadilla – Char-grilled large tortilla pancake crammed with cheese, onions, Pico de Gallo salad and mild salsa, served with sour cream & guacamole. The Pico de Gallo salad, also known as fresh salsa, is a traditional mix of chopped tomatoes, onion, chillies, coriander, cilantro, a bit of salt and lime juice. Mix that with cheese, pack in a thin tortilla and you’ll make me smile. While I can hardly think of how this could get better, I get to discover the guacamole. It’s honest, fresh, with a taste of lemon or lime or some magical ingredients I cant figure out. The guacamole is clearly made out of real and fresh avocado – Yes, that’s a thing, as many other places serve processed avocado paste as guacamole. The sour cream is uncomplicated, and that’s how it should be, in this context of many other competing tastes. I also give full attention to the side salad, as it’s well seasoned with a mix of oil, vinegar and spices that contrast very well with the soft cream and guacamole. The starter is richly decorated with a spice that I can’t identify without asking the chef. It’s ‘sumac’, a natural, tangy, lemony, taste enhancer, that’s giving a fascinating and exotic twist to the whole dish. Nutrient wise the quesadilla is well balanced, thanks to the thin tortilla that does keep you away from too much white flour, and the honest sides that are neither too oily or too salty. It’s all finished before you can say cheese, so I’ll move on to plate number two. It’s only normal to feel sceptical when you read words like ‘exotic’ in a food menu. But in this particular claim, the chef has earned his right. The special touch comes from the marinated meat skewers, be it in secret coconut mixes, the result is worth applause. 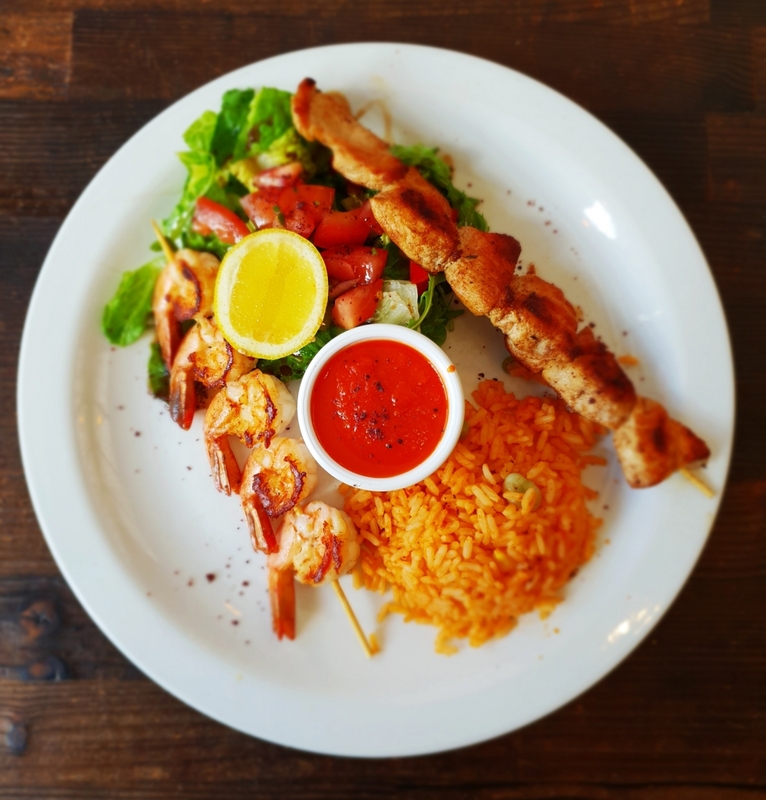 The prawn is amazing, crispy on the outside, perfectly done on the inside, marinated flavours coming from all sides of the skewer. The chicken goes great with the salsa, which has a very fresh, lemony taste of home made tomato sauce. Again, the side is uncomplicated, so that it only complements and does not alter the main aromas. There’s a rich salad with well seasoned according to the expectations set by the starter. And there’s enough rice to feel that the rainbow of nutrients meets a feeling of satiety. The rice is spiced and contains a few beans, just to be reminded that this is a mexican dish. Sumac is all over the place, like a red trail of flavour that shows me the way from side to side, from skewer to fork. The dish is nutritionally rich thanks to the combination of fresh produce, unprocessed sauce and flavourings. Also, the meat is very fortunately grilled rather than fried, which on top of the great taste makes my stomach thank me for my choice. Overall the meal was a tasty choice with a nutrient variety as lively as a colouring book. Cafe Mexicana gave me a tasty nutritious meal, shortly after my Saturday morning workout, just in time to help me recover my strength and keep the serotonin flowing. Had a twist of lemon, a twist of colour, a twist of spice that will also play nice with my health.